Bikes and The City: Ketchup. 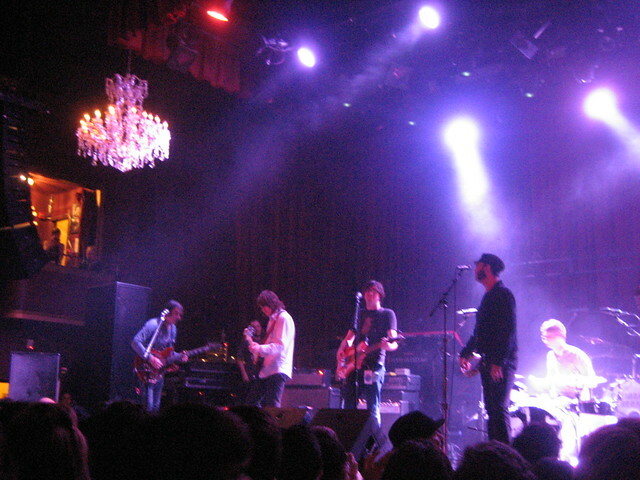 Let's do a little bit of catching up with los local events. Mucho good stuff happening this month. The two bike citizens on this year's promotions are very nice, and represent a very mellow non-racer type but not sure why they are headless?! 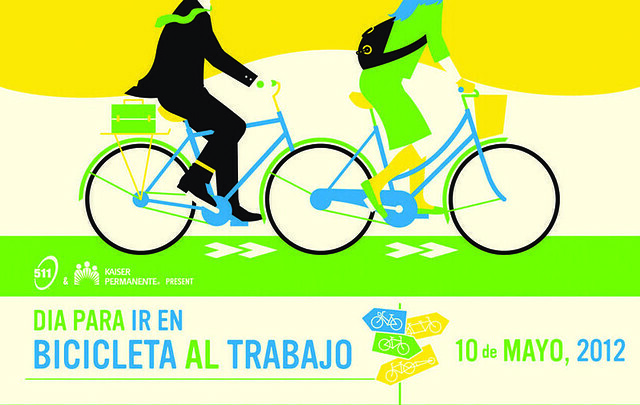 Thursday, May 10 | 6-9pm, Public Works, 161 Erie St. "Celebrate San Francisco's biggest day of bicycling at the SF Bicycle Coalition's big Bike from Work Party with DJs, a photo booth, fabulous raffle prizes, snacks hosted by Whole Foods and complimentary bicycle valet. 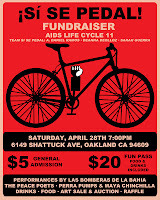 $5 for current SF Bicycle Coalition Members, $10 for non-members or join at the door ($35) & get in free." 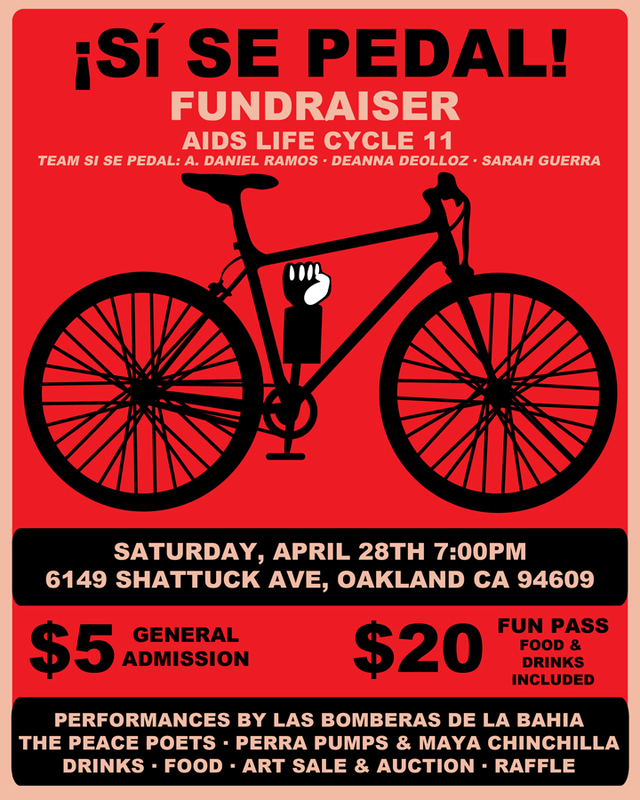 The Crazy 88's AIDS/LifeCycle Team is hosting this year's most festive fundraising event for the San Francisco AIDS Foundation! The first 150 guests who pay the $8 cover will receive a California Roll from neighboring Sushi Delight restaurant and a feather boa…..because there is no such thing as enough boas. "How about a group of Los Angeles friends, biking from San Francicso to LA (home). 500 miles, seven days, fully loaded ride for their friend Kam. None of the conveniences like mobile tent cities, swag wagons or fully stocked rest stops. These guys do it rugged, not professional cyclists and are powered by motivation. Through this project they hope to raise awareness of my rare genetic muscle debilitating and degenerative condition; HIBM, because it's no longer about finding a cure; it's about funding the cure." 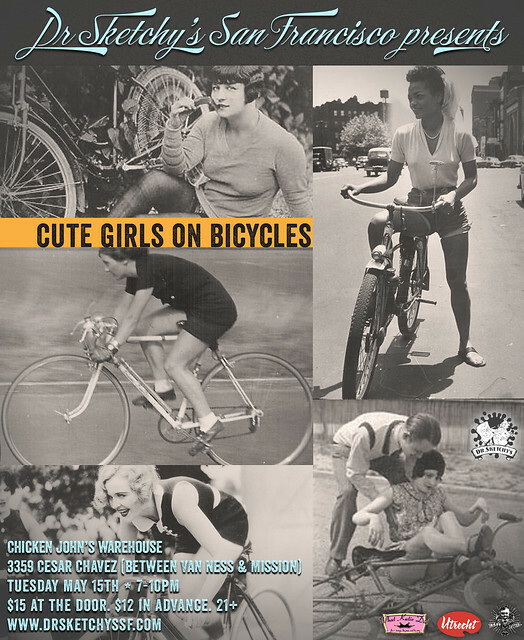 TUESDAY MAY 15: DR SKETCHY'S PRESENTS 4TH ANNUAL CUTE GIRLS ON BICYCLES! "Ding ding, it is that time of year! 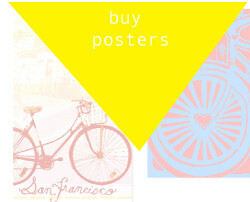 Time to ride your bike and draw the cute girls of San Francisco with their bicyclettes." "After many days of planning and hair-pulling, mamakSF's Kickstarter project is up and running. You have been supportive and patient with the build up of 'the little bike food cart' that could. For that, I am forever grateful. We wouldn't be here today without your love, support and belief. It's not all about funding via Kickstarter, though that helps. I hope I get to feed many, if not all, of you some day. Let's get this food party started!" "Local bicycle enthusiasts celebrate San Francisco’s vibrant bicycle culture with 60-second video “Do the Wiggle.” Instant classic reminds all cities that robust bicycle infrastructure supports healthy, sustainable urban living." 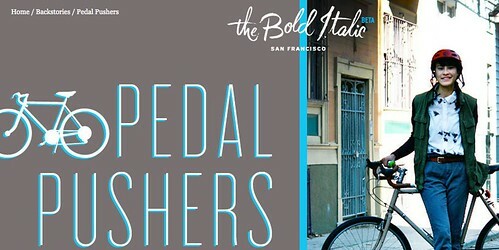 "The 2012 Tour de Peninsula offers Bay Area families a day of fun, fitness, and healthy family activities. 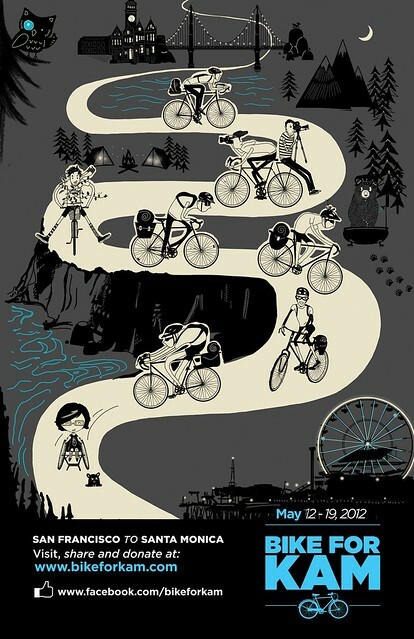 Now in its 21st year, this ride is one of Northern California’s most fun recreational cycling events/family/social gatherings. Held in the scenic, mellow Coyote Point Park alongside the San Francisco Bay in San Mateo, the TdP is a perennial highlight of the Bay Area's recreational social calendar. The TdP is a variety of great cycling routes designed for all levels, from young children and first time riders to serious cyclists. During and after the ride, a day of family fun activities takes place in the park, with a children’s playground, barbecuing, picnics, live music, and equally lively conversation. Proceeds benefit San Mateo County Parks Foundation and Bicycle Sunday – car free biking on Canada Road." will be participating in this year's Climate Ride. "This September, we will bike 300+ miles over five days, to raise money for a host of great organizations working toward real climate solutions.Climate Ride has emerged for me as a key opportunity, along with a handful of others (Keystone XL action, etc.) to make a significant contribution and tackle the challenges which so many of us very deeply care." Okay well, that's lots of good stuff going on. Wow, Meli, I worked up a sweat reading that one! What exciting times in SF. Bob and I just keeping hoping this land of milk and honey is in our future and your posts just keeping eggin' on the dream! Nothing that's already not been said, but nothing wrong with repeating myself. Thank you for the love and support Meli! I shall see you and feed you soon. 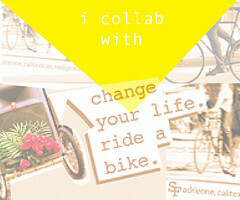 And one more thing: 2ndSaturdaySF, a new social ride, kicks off on May 12 @ 7:20am from Duboce Park. Yeah, I know it's early. But mornings are awesome! I'm guessing the new slate of images of headless riders are because of the helmet debate. A picture without helmet brings out the pro-helmet people, and a picture with - the anti-helmet people. Avoid controversy and take out their heads! visually annoying, a debate that needs to be presented if needed, and instead it is just skipped +poorly decided during a day that it is possible to reach many people that are rather undecided to do their commute on bicycle more htan just once a year.